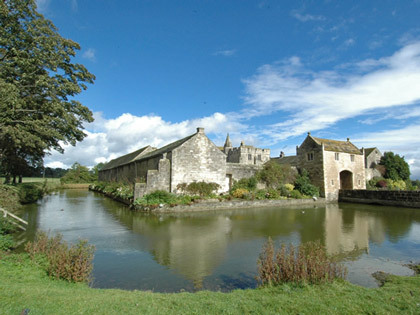 A fortified manor house with a moat. The Great Hall was probably constructed in 1280 before a licence to crenellate was granted in 1310. It became a farmhouse and was neglected during the 16th and 17th centuries but it was bought by the descendants of the original de Markenfield family during the 18th century and was restored in 1980. Private, but is now available for civil wedding ceremonies and group tours and is open 32 afternoons every year.